The all-new 2019 Volkswagen Touareg SUV will be larger, lighter and available with a plug-in hybrid powertrain when it reaches the UK in the autumn. Prices are expected to start in the region of £46,000. The third-generation Touareg will be Volkswagen’s largest ever SUV, with the new model stretching almost five metres long and two metres wide. However, despite its stout dimensions, the new Touareg weighs 106kg less thanks to the use of lightweight aluminium which makes up 50 per cent of the car's construction. 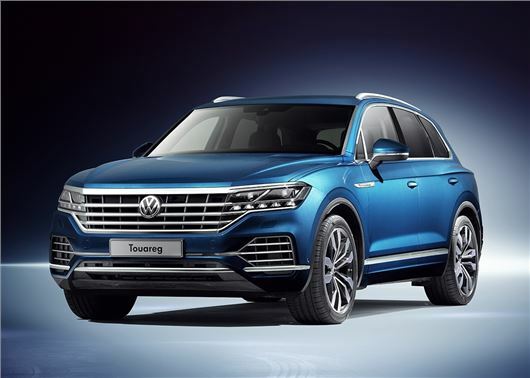 Engines for the UK market are still to be confirmed, but the Touareg has been unveiled in China with V6 and V8 diesels, along with a V6 petrol and plug-in hybrid. Volkswagen hasn't released any details on fuel economy, but expect the V6 diesel to be offered with 231PS and 286PS. The V8 turbodiesel will develop 421PS while the solitary V6 petrol will offer 340PS. All models will get four-wheel drive as standard, along with an eight-speed automatic gearbox. Given the Government push to ban diesels, the plug-in hybrid is widely expected to make it to the UK with a V6 petrol linked to an electric motor to develop 367PS. There are no details about the hybrid's all-electric range, but 20-30 miles from a single charge would be a realistic expectation. The wider and longer body should provide more interior room for passengers and luggage, with boot space increased from 697 to 810 litres with the rear bench up. The rear seats can also be retracted by 160mm, while the backrests can be titled back up to 21 degrees to allow even the largest of adults to stretch out and relax over a long trip. Up front, the driver gets a digital dashboard, with the traditional instrument binnacle replaced with a 12-inch screen that can be customised to show maps, route directions and off-road driving settings. The steering wheel also gets touchpad controls for audio and maps, allowing the driver to make adjustments with a simple swipe of the thumb. The China launch model debuts Volkswagen's next-gen infotainment, with high spec models getting a large 15-inch dash-mounted touchscreen with pinch and swipe controls to access DAB audio, four-zone air conditioning and seat massage functions. As with many vehicles in the Volkswagen range, full smartphone connectivity will be included, with MirrorLink, Apple CarPlay and Android Auto. All Touaregs will be capable of towing 3.5 tonnes when hooked to a braked trailer and the ball neck of the towing bracket will extend and retract from the vehicle floor at the push of a button. Optional all-wheel steering should also pave the way for an R-Line performance model, with improved high speed handling. Volkswagen's also promising limo-like comfort on the road, thanks to an all-new air suspension system that should iron out potholes and automatically lower the car by 40mm to make it easier to get things in and out of the boot.